What Is a Better Form of Cardio: Bicycling or Running? Running and cycling are both excellent forms of aerobic exercise. Both allow you to engage large muscle groups in a sustained activity, which elevates your heart rate and delivers a wide variety of health benefits. Running burns more calories than cycling, and it can make your heart work a little harder. According to experts at Harvard Medical School, the heart rates of trained triathletes tend to be six to 10 beats per minute higher when they are running than when they are cycling. As a weight-bearing exercise, running delivers the additional health benefit of stronger bones. The downside is that injuries are more common in running than in cycling, which is easier on the joints and doesn’t lead to as much muscle soreness. This makes cycling a better choice for people who are overweight or who have knee or other joint problems that might become aggravated by the high impact of running. A 150-pound runner cranking out seven-minute miles will burn about 1,000 calories per hour. A cyclist pedaling between 16 and 19 miles per hour will burn about 850 calories per hour. A number of variables can influence these rates, though. If a cyclist’s route includes a lot of hills, he is likely to burn more calories at a slower speed, and if the route includes a lot of long, steady downhills, he will burn fewer calories at 19 mph than if the road were flat. Running and cycling both temporarily dull your appetite. In one study, a group of healthy men ran for an hour on one day and then rode vigorously for an hour on another day. During each workout, the men’s levels of ghrelin, a hormone in the blood that stimulates hunger, were lower than the levels they recorded when sitting quietly. Running is a better fat-burner than cycling. In one study, 10 male triathletes did increasingly difficult workouts in both running and cycling and were given blood tests at 60 percent, 65 percent, 70 percent, 75 percent and 80 percent of their maximum effort in each discipline. The amount of fat they burned for energy was significantly higher when they ran than when they cycled. 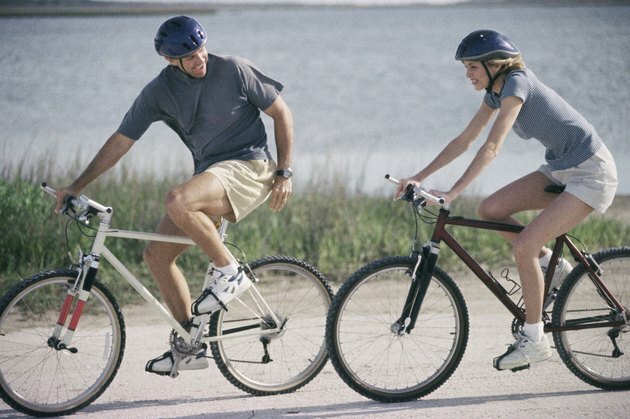 New York Times: What Is a Better Form of Cardio: Bicycling or Running?